Good luck go fast and be safe. It's been quiet from Sweden recently. I hope you've been busy busy getting the bike ready - and taking care of life in general, too. Be safe, go fast, have FUN! Thanks! The weather forecast is looking good so I think we are up for one fun weekend. 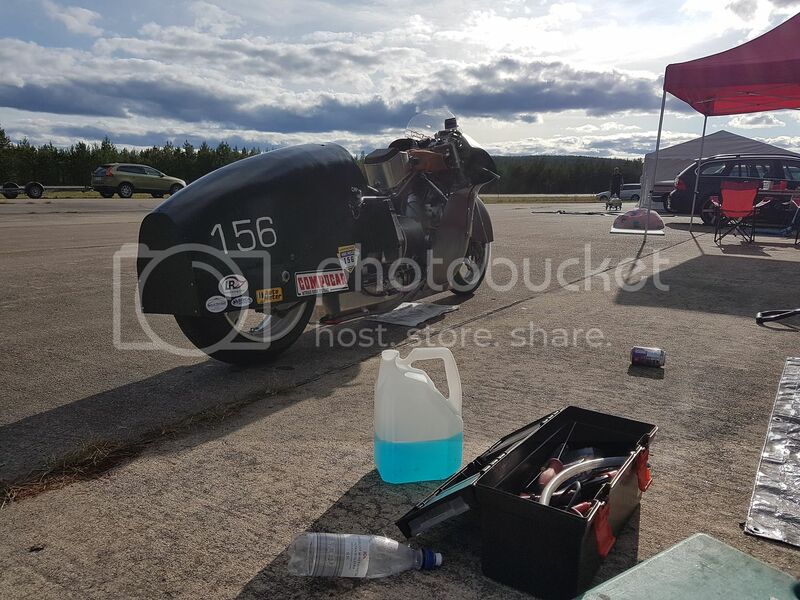 The bike has been more or less race ready since this spring so I have only made some minor modifications to it, I´ve spent most of my spare time doing things around the house and getting into pistol shooting so I haven´t done much in the workshop. This will soon change since as soon as One Mile is over I will start testing and modifying JU-02 in the test rig, I have an interesting winter ahead of me with lots of bench tests to sort the 270hp bike engine out before installing it in the bike! 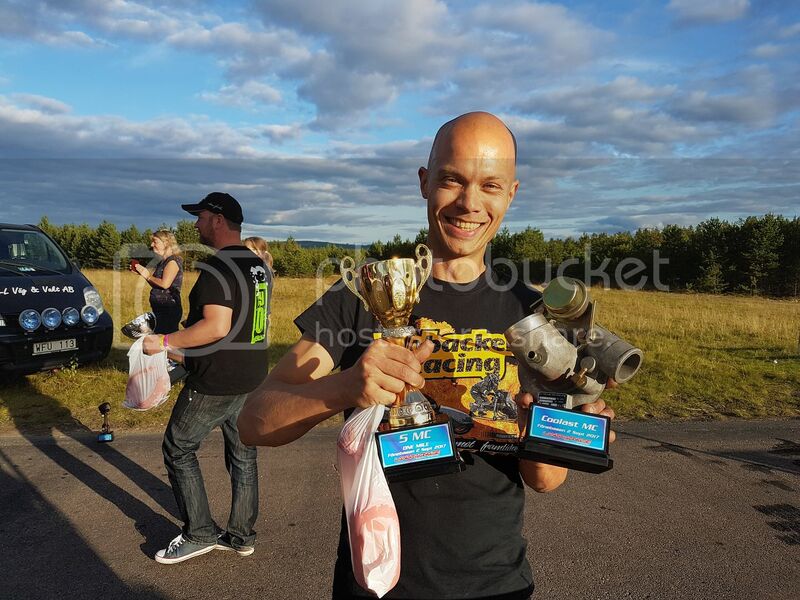 The day couldn´t have been any better, awesome weather, awesome runs by many racers (one finnish guy ran 402km/h with his turbo-Hayabusa!) and the bike performed although it sang on its last verse. 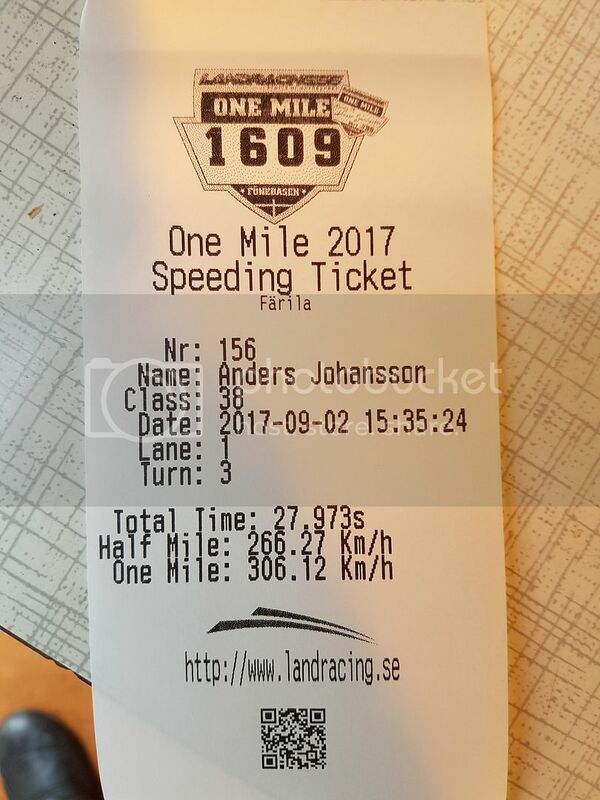 First off I ran a 295km/h run with a crappy start, so we decided to try again to get part 300km/h without water injection. The injectors bottoms out at 2.4bar so I am a bit short on fuel but the second start is great and the front wheel feels like it is lifting from the track when I take off. Unfortunately the oil is heating up and the pump can´t keep the pressure over the 3kg that the safety pressure switch is set at so the fuel pump shuts down and aborts the run. After some consideration I decide to lower the switch pressure to 2kg just to get another run out of the engine, it runs crazy hot and I knew it wouldn´t survive the weekend so I didn´t care that the thrust bearing might get toasted by this. At the last moment I also decided to run the water injection since I hoped it would lower the temps a tad. 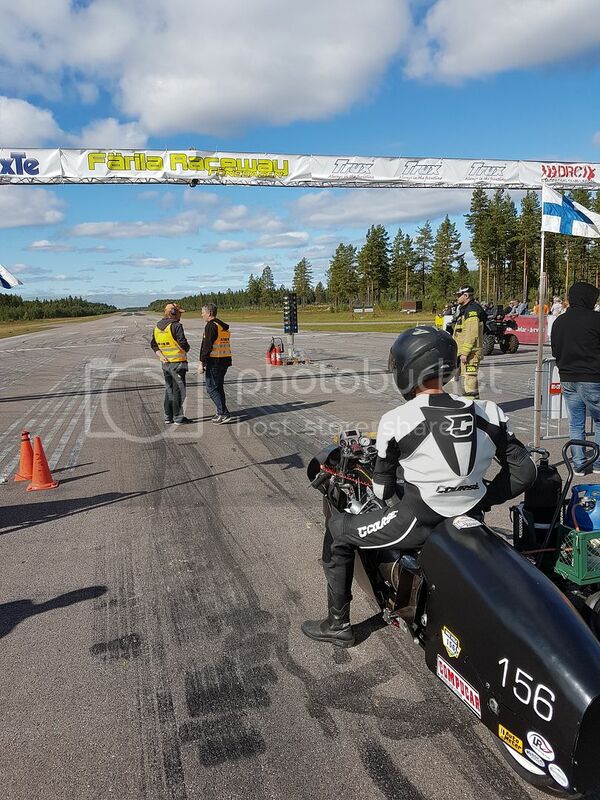 I got off by yet another crappy start since the high flow of water spray made the engine flutter at low P2´s, so I let the brakes go and crammed the trottle as soon as I got off the starting line. The bike ran perfectly all through the run (although at just 2.4bar P2) but it was white glowing hot when I stopped. I am so satisfied with the race and with a toasted 140hp JU-01 engine I can gladly start the testing and modifying of the 270hp JU-02 engine and hope to have it running by next summer! Now I´ll finish off my glass of scotch and go to bed, been up since 04.00 this morning so I am a bit tired. Fantastiskt! Så skoj att följa utvecklingen, både motgångar och framgångar med cykeln och motorn på forumet. Grattis! Fantastic! So fun to follow developments, both adversities and successes with the bike and the engine on the forum. Congratulations! Wow! Riding 306 kph on a white hot jet engine!! Just amazing as usual Anders! I love the fact that everyone covers their ears and runs the other way when you are riding! Congratulations. Now get on a two mile track and go 350! I just cannot find words to say what a great accomplishment you have made! The engine sounded great and the speed was fast- plus, it was a safe run. What could be better than that! The pulse-jet BBQ was a nice touch. Outstanding Anders - it went like a freakin' jet!!! Congratulations Anders! What an accomplishment! Thank you very much guys! It was such a relief to see the 300+ top speed on the GPS logger while waiting for the towing car at the end of the track, if I had toasted the engine after a 299km/h run it wouldn´t have felt anywhere near as good. Here is a riders view of the 306km/h run, temps are mad and P2 is too low since the injectors are bottomed out. Still a decent run. A slam dunk for the "Coolest Motorcycle" award. I like that trophy. Corngratulations on a fine day at the races, Anders. Are we going to see some 300 km/h T shirts?